From today Air Malta tickets will be available on Ryanair's website in a tie-up between the two carriers. 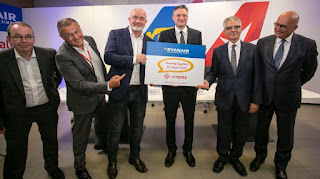 The press release from Ryanair proudly boasted that the deal will allow Ryanair’s 139m customers to book Air Malta flights on the Ryanair.com website. From today, Maltese customers can browse and book Air Malta flights on 21 new routes from Malta to 8 different countries across Africa, Asia and Europe, including Russia and Tunisia. However, we tried to book flights from London Gatwick to Malta and flights from Malta to the London Heathrow on Air Malta on the Ryanair websites and were greeted with "Sorry we don't fly between" those cities. We also had colleagues check in both France and Norway and they were also unable to find Air Malta flights on the Ryanair website. Air Malta’s Chairman Dr Charles Mangion said, "This is a landmark agreement where both airlines are cooperating together for the benefit of their mutual customers - this agreement will also help Air Malta increase its visibility in overseas markets and tap into new revenue streams. We look forward to further cooperation between the two airlines for the benefit of our clients”. The arrangement seems stacked in Ryanair's favour, earning money on all Air Malta sales, the ability to control the market and fares, the ability to reduce yield and direct potential passengers away from Air Malta flights and push them towards Ryanair operations. What's in it for Air Malta? Or is this just the first step in the little Island carrier being taken over by Ryanair? Such a shame as Air Malta had a lovely positive reputation in Europe.